Figure 1. Brooks spot infection at about mid-season. Photo: Keith S. Yoder, Virginia Tech. Brooks spot is a fungus disease caused by Mycosphaerella pomi. It is a minor disease that occurs throughout the northeastern and mid-Atlantic apple growing regions of the United States and occasionally as far west as Iowa. The more susceptible common commercial cultivars include 'Jonathan', 'Golden Delicious', 'Stayman', 'Grimes Golden', and 'Rome Beauty'. 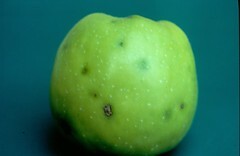 Brooks spot first appears as irregular, slightly sunken dark green lesions typically on the calyx end of immature apple fruit (fig. 1). As the fruit matures, the lesions turn dark red or purple on red areas of the fruit and remain dark green on green or yellow areas (fig. 2). The disease is sometimes confused with the physiological disorders Jonathan spot, cork spot, and bitter pit. However, Brooks spot usually appears earlier in the season and shows little browning of the flesh underneath the lesion. Jonathan spot lesions are usually rounder, and the lesion edge is more abruptly sunken, with a shallow browning of the flesh underneath. Figure 2. Brooks spot infection showing greenish lesion against yellow fruit color. Photo: Keith S. Yoder, Virginia Tech. Ascospores discharged from overwintering leaves in late spring and early summer initiate the primary infection. Ascospores germinate in 6 hours at 61°F to 75°F. Leaf infection through stomata can occur after 96 hours of continuous wetting at 68°F, but alternating wetting and drying conditions may enhance infection. 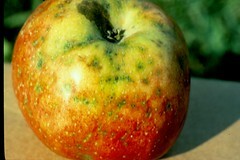 Fruit lesions appear in July and August. Secondary infection is not known to occur. Leaf infections remain inactive until late summer, when small purple lesions begin to appear. Following leaf fall, the fungus colonizes the leaf extensively. Most fungicides used in the early cover sprays for summer diseases are effective against the Brooks spot fungus. The sterol demethylation inhibitor (DMI) fungicides used for early season scab, mildew, and rust control are ineffective. Original text prepared by K. S. Yoder. The original version of this article appeared in The Mid-Atlantic Orchard Monitoring Guide (NRAES-75) and is reproduced with permission from the Natural Resource, Agriculture, and Engineering Service, Cooperative Extension, 152 Riley-Robb Hall, Ithaca, New York 14853-5701, U.S.A. (607) 255-7654.